Shot on this date in 2008. Tabletop with remote flash and on camera fill-flash. Strange subject, I know. It is based on an idea I had years ago for a 3-D photograph. I wanted to place a huge screw in the middle of the street, kind of a contrast of object scale in an unfamiliar locale. (I’ll still pull of that shot one of these days). 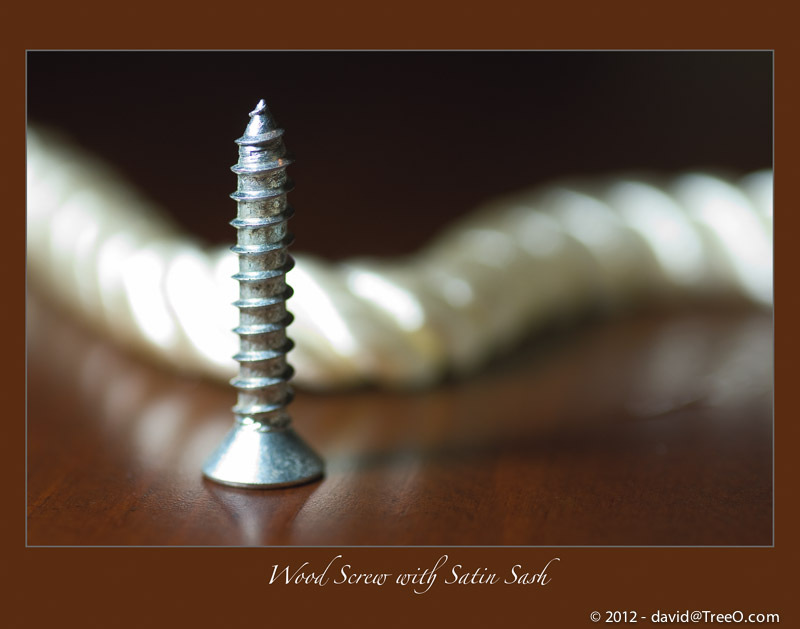 Anyway I said to myself, self, why not just photograph a screw? During the session, I spotted this curtain sash laying nearby and noticed the same spiral shape and thought the reflective surface of the rope would also add to the composition. Different, don’t you think? As usual, your comments are appreciated. Hey David, love this shot. I really like the sash on the right side and the reflection on the left side. The photo of Cleo was great too.